Brew Facts: Almost all of Anchorage’s beers are brewed with Brettanomyces, and this one is no different. 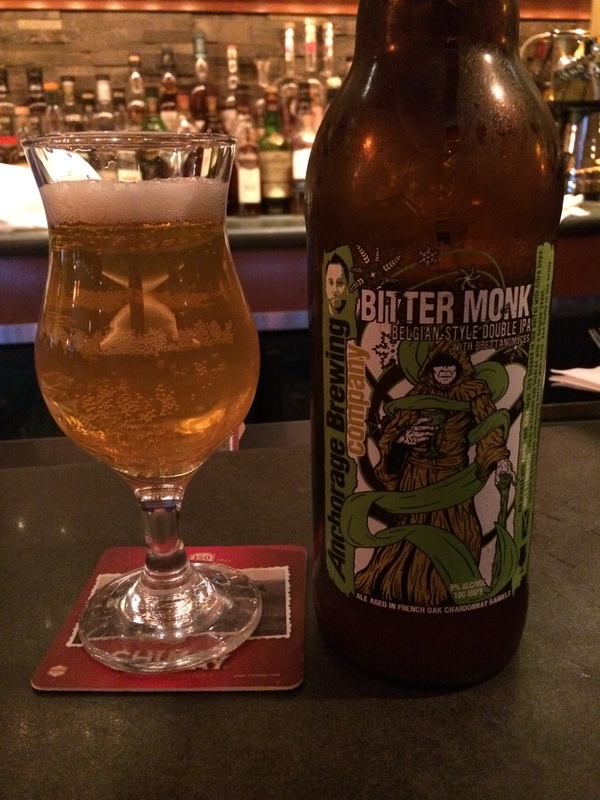 Bitter Monk is triple-fermented and aged in oak chardonnay barrels with brett added. Appearance: On pouring, large bubbles rise and form into a soapy head that eventually settles into a carbonated white film. The tone of the beer is surprising, looking like pale straw or a lite pilsner depending on how the light hits it. A mild chill haze is there, but it’s pretty easy to see through the glass to the cooler of beers on the other side. Occasional big bubbles find their way to the top like slow drip coffee. Aroma: There be lemon drop and Belgian yeast in this here smell! A spicy, citrus funk note gives the aroma a bit of character. Vinous tang lingers with the funk to lend some astringency. There is an odd lactose/sour element that hangs in the background but doesn’t spoil the more delicate qualities. Taste/Mouth Feel: A sip hits you with prickly carbonation and substantial mouth feel that thins on the way down. The tongue finds a burny tang hit, some red grape, and fruity/citrus yeast. Finding its way into the mix is timid pear and bread. The wood/oakiness helps mellow and tame the sweeter citrus and vinous qualities. The finish is dry and nears mineral/metallic levels, but a hop bitterness brings it back from the brink. For this beer having brett in it, it blends well and keeps the funk in the background. Final Thoughts: Anchorage has created a chardonnay-barreled, Belgian IPA with brett that is both unique AND well-crafted. Some breweries try mixing any and everything into any number of concoctions, not caring what is brewed as long as it’s different. (Springhouse anyone?) This is clearly not one of those beers and plenty of thought and expertise went into producing it. The vinous qualities and brett really take this beyond the humble roots of the style. If drank too cold or fast, I could see missing the subtle elements and not thinking much of it. Take some time with this beer and you’ll find a surprisingly refined, complex beer that is a highlight of the Belgian IPA style.